Imagine a rough and tumble coal miners’ strike in West Virginia, in the Appalachians, during the reign of Ronald Reagan. Then imagine a bunch of queers from San Francisco sending those miners money and support, and taking the striking miners into their homes while the union is protesting, during a whole year. Then, the gay guys go to West Virginia to help out the miners’ families, too, and throw fundraisers in the Castro. Well, that’s the story of what happened in Thatcher’s England and Wales, in 1984 — during the bitter, year-long Welsh miners strike. The ultimate results were a losing battle for the miners, but enduring long-term mutual support and understanding between two very separate communities. After that gay support, the miners of Wales marched with gay people for their rights in the UK, for many years. 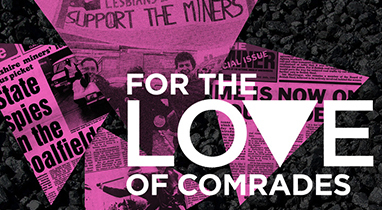 The miners ’84 struggle against Thatcher-ism, and their coming round to comradeship with London gays is the story of “For the Love of Comrades” by Micheál Kerrigan, now playing at NCTC in San Francisco. Rarely has a political drama come out of such “strange bedfellows.” The Lesbian and Gays Support the Miners (LGSM) campaign inspired the 2014 film, Pride, as well as Kerrigan’s play that opened in Northern Ireland in 2013, and toured the U.K. on the 30th anniversary of the strike. Now, at New Conservatory Theater Center, directed by Jeffrey Hoffman, the story comes to the U.S., with Script Development by Patricia Byrne and Mary Connors. The single set, a homey, cluttered apartment in London, all done up in 80s political posters, music, and paraphanalia, works well to put us back in the time of the Iron Lady Thatcher and her buddy, Reagan, who had viciously broken the air controllers as his first act. In this US Premiere of the play formerly called “Pits and Perverts” — after a gay fund-raiser concert for the miners, Sean (Mike Duffield) and Gene (Stephen McFarland) play a believable, conflicted, and troubled couple. Sean is convincing and courageous in his ardent, passionate support for the miners, who are living on the edge, making national protests against their brutal treatment. Sean is a young man with a cause, played forcefully and powerfully by Duffield. As his boyfriend, a music major, facing his final thesis/concert, McFarland gives a superb rendering of a nervous young musician/scholar coming to understand his lover’s political passions. MacFarland slowly and believably comes round to hosting the two miners who appear on their doorstep for extended stays, a beautiful turn of events in both actors’ capable hands. The two miners who seek refuge in their place, David (Shane Fahy), and Rhys (Paul Rodrigues) are predictably put off when they realize their hosts and benefactors are “poofs.” One of the glories of the historically-based play turns out to be the slow and subtle conversion of first, David, and then the severely homophobic Rhys from fear to friendship with the gay guys. It’s really lovely to watch the transformation — believable, touching, and sensitively done. David is converted by art and music and friendship to the gay cause. The touchy Rhys is beautifully embodied by Rodriguez, worried about his wife and kids back in Wales; but he comes to understand his benefactors, however unwillingly. Touching and emotional acting here, a pleasure to watch unfold. Kerrigan shows us that those who are oppressed and exploited must join each other to survive and win — across class and cultural chasms. The ghost of Sean’s lover who was killed in the Bloody Sunday uprising of 1971, played by Adam Odsess-Rubin comes and goes, putting Sean into fits of painful memories and insecurity. While Gene’s friend and music student Candida (Alyssa Stone) serves as a useful foil. She has middle class beliefs and has fallen for Thatcher’s anti-union progaganda. Kerrigan lets her conversion unfold slowly, as well, perhaps less convincingly than the down-to-earth miners. Great accents throughout remind us that we are in a foreign but fact-driven story. The narrative and the TV-news shots of the actual events of 1984 Britain are usually helpful backdrops, but not always. The TV reports inform us about a complex and significant strike and the long-lasting unity of “pits and perverts.” When the miners return the favor and march in Gay Rights protests, we see that the whole historical story proves that “the love of comrades” really works. “For the Love of Comrades”by Micheál Kerrigan, at New Conservatory Theater Center through October 11, 2015. For further information click here. “For the Love of Comrades” by Micheál Kerrigan, wth script development by Patricia Byrne and Mary Connors, U.S. premiere produced by New Conservatory Theater Center. Director: Jeffrey Hoffman. Sound: James Ard. Costume: Corrida Carr. Dialect Coach: Jenna May Cass. Scenic & Technical: Devin Kasper. Lighting: Christian V. Mejia. Stage Manager: Kaitlin Rosen. Props: Adeline Smith. Vocal Coach: Joe Wicht. Sean: Miles Duffield. David/Lieutenant: Shane Fahy. Gene: Stephen McFarland. Jim: Adam Odsess-Rubin. Rhys/Soldier: Paul Rodrigues. Candida: Alyssa Stone. Posted in Reviews.Tagged Barry David Horwitz, Charles Kruger, For the Love of Comrades, Jeffrey hoffman, Margaret Thatcher, Micheál Kerrigan, miners strike, New Conservatory Theater Center, San Francisco Theatre Reviews, theatrestorm.